Wherever I travel around the world with Norwegian Cruise Line, I always select a souvenir that reminds me of the special qualities of a particular port of call. It might be a savory delicacy, such as a sizzling barbeque jerk sauce from Jamaica, or a handmade turquoise and silver ring from Costa Maya, Mexico. But more often than not, what I most enjoy collecting is an item that’s entirely unique, abundantly available, and absolutely free for the taking. What could that be, you may ask? That’s right, sand! At every port of call, I always carry a spare ziplock bag to collect a handful of sand. Once home, it’s lovingly transferred into antique glass containers. And if you think that such a collection might be rather bland, think again. When you take a close look, no two islands are identical in topography and geography. Some island beaches are composed of soft, white sand that is as silky as talcum powder (Culebra, Puerto Rico). Others are black and pebbly (Hawaii). But the most beautiful sand – as well as one of the best beaches in the world – is the pink sand that skirts Bermuda’s coastline. And most important, my special collection always reminds me of the memories made on my Bermuda cruise excursions. Bermuda’s pink sand beaches, although some of the most picturesque in the world, often take a backseat to some of the island’s better-known landscapes, such as is its pastel-painted buildings and rolling green golf turfs. And mind you – we are not complaining about this lesser known natural wonder. Because while everyone else is scheduling their tee time and restaurant reservations on the island, Bermuda’s pink sand beaches are often unspoiled and seldom crowded. And once you see it for yourself, it’s almost hard to believe. We are talking a true hue of pink, and not some pale comparison or a photo that’s been highly filtered. This is simply nature’s beauty. 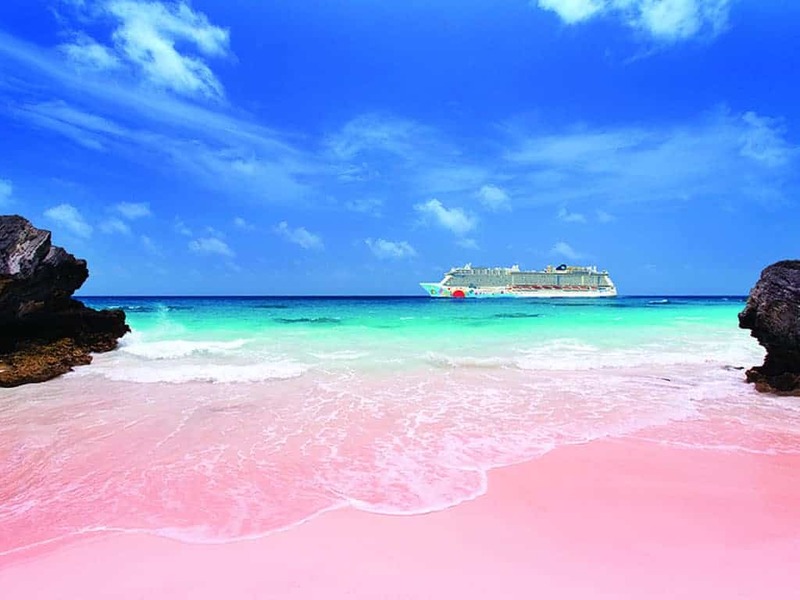 The pink sand earns its color from a geographic phenomenon called foraminifera, a marine organism. When it dies, the foraminifera shells sink to the ocean’s bottom and then are washed ashore and drenched in the sun and sand to create the famous rosy hue. The best place to witness this phenomenon (although there are many spots to select from) is Horseshoe Beach. Earning its name from its curvaceous U-shape, Horseshoe is Bermuda’s best-known spot for pink sand. It’s also easily accessible and you’ll have plenty of time to explore, considering so many of Norwegian’s Bermuda Cruises include extended nights in port. Just take the #7 bus from City of Hamilton or the Royal Naval Dockyard, the hub for your cruise vacation. Private taxi service is also available. You needn’t worry after any detail. At Horseshoe, you’ll find every beach item available for rent, from chairs and towels to boogie boards and snorkel gear. You can soak up the sun and gaze at the crystal blue waters lapping against the blush-coloured shore or engage the entire family in favourite water sports. You’ll even find some stunning cave formations to explore and climb or catch a morning sunrise. You’ll also find a range of beach restaurants with favourite family offerings (burgers and fish fries, etc.) as well as sweet rum sizzlers. Best bet beyond the beaches: You can walk the entire length of the South Shore. Make sure to stop by Gibb’s Hill Lighthouse and climb to the top. It’s well worth the effort. And of course, some of life’s special pleasures come quite easily and sparing extra sweat, such as reserving a Bermuda cruise on Norwegian Cruise Line. With award-winning ships such as the Dawn, Breakaway, and Escape, that boast every luxury, and convenient embarkation ports from New York or Boston, a Norwegian Bermuda cruise is a phenomenon in its own right. Don’t delay in reserving a special deal on a 7-Day cruise. Dare I say – you’ll be living in the pink!